Lot 1123, Tingkat Selamat 6, Kampung Selamat, 13300 Tasek Glugor, S.P.U. Malaysia. Kilang Bihun Beras Indah Sdn. Bhd. (KBBISB) had originated from Kilang Bihun Sin Hong Lee. It was established in 1984 and based on Butterworth, Pulau Penang in which operated in rice vermicelli business. 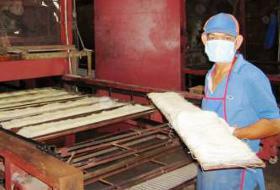 In early of 1984, KBBISB began as a small scale rice vermicelli manufacturer with less than ten employees. It started selling its products using a brand of Cabai Burung. The founder of Kilang Bihun Sin Hong Lee was our Managing Director Mr. Un Pia Hai. In 1996, he co-operated with Miss Teh Moi Gaik (Mrs Un) and then changed its name to Kilang Bihun Beras Indah Sdn Bhd (KBBISB). Although the company name had been changed, the business spirit and achievements are still to be improved and inherited. Nowadays it becomes one of the leading manufacturers of high quality rice vermicelli and laksa in Malaysia. The household brands of our products are Cap Cabai Burung and Cap Bunga Kangkong. Launched on 1997 May 05. The tradition of Chinese entrepreneurship is diligent and thrift which is a common creed of success from scratch. About the rice vermicelli production, it is an industry easily to learn but difficult to master the skills. This industry in Malaysia has more than half a century. In the past few decades, it has experienced severe tests and become one of the leading manufacturers. Undoubtedly, it has a strong determination and a good adapting condition to environment. The founder of Kilang Bihun Beras Indah Sdn Bhd (KBBISB) - Mr. Un Pia Hai was a typical example. In the early years, Mr. Un started his small business from traditional mechanism of rice vermicelli production to machine- made all by hands-on to develop the business assiduously. After 20 years of study and research with the spirit of excellence, a lot of achievements had been reached. In order to further develop the business and meet the market demand, Mr. Un bought a two acres land in year 1997 to expand and invest in KBBISB. It was facilitated with advanced equipments and a good planning operation. It has two production lines which are Bihun and Laksa. The quality of product is continuously improved and enhanced in order to meet government specifications and to meet consumer demand. KBBISB products are sold well throughout Malaysia. The well-known brands are Cap Cabai Burung and Cap Kangkung. Copyright ©2011 KilangBihunBerasIndah.com. All rights reserved.